*Note: Both The Club and Aqua closed in 2015. A few weeks ago I went home to St. John’s Newfoundland for a much needed visit with family and friends. After my brief and exhausting 3 day stopover at Christmas I felt cheated out of down time and girlie time, so I was excited to relax and enjoy my hometown. And, if you know me, relaxation involves eating, and of course trying the new restaurants that have opened in St. John’s since I moved away last summer. For our girls night out and to celebrate Rachel’s birthday, the girls decided that The Club on Duckworth street was the place to go. So on my last evening in St. John’s I headed down to The Club. Owned by Chef Mark McCrowe who also owns the ever popular Aqua, The Club is a self-proclaimed Gastropub offering Steak, Oysters, and local beers on tap. When I arrived, I was greeted by Rebecca, an old-coworker and friend of Rachel’s, and she led me to a big corner booth in the back of the dimly lit restaurant. Despite the masculine undertones of the decor (i.e dark colours and antlers), the restaurant feels trendy and metropolitan with its mix of rich woods, cool light fixtures, and kitschy nic nacs. I am very happy that the owner was able to overcome the fact that there have been a multitude of restaurants in this space before, and they have truly made it their own while highlighting the classic historic features of the space. The mason jar candles, the heavy antique silverware, and the clever use of tea towel napkins made the place feel comfortable and trendy and I was impressed with the attention to detail. 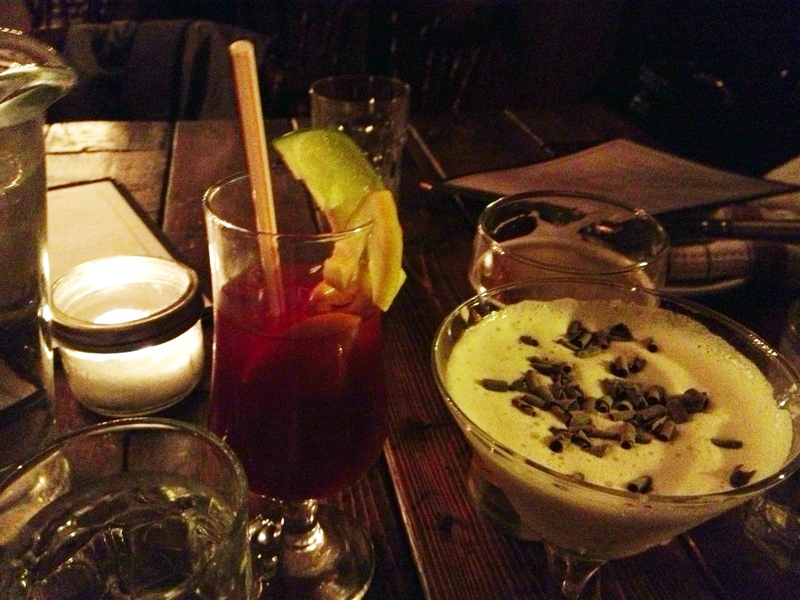 I ordered a Sangria and waited for the rest of girls to arrive. There weren’t too many people around on that chilly Monday evening, but that is not surprising for St. John’s, and soon I was distracted by the arrival of 4 of my nearest and dearest best friends: Sarah, Meghan, Vanessa, and of course, the birthday girl, Rachel! 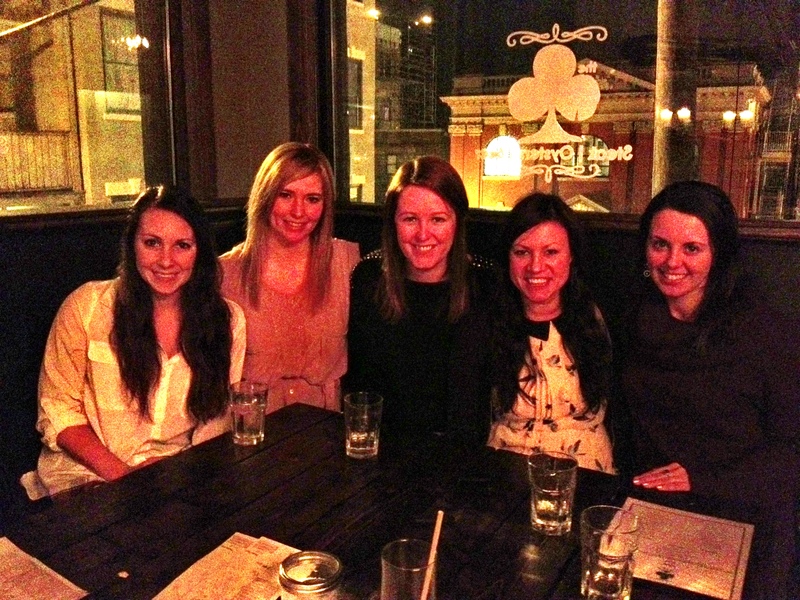 Once all the girls had arrived, we ordered drinks and per usual, took awhile to get our order figured out. Rachel ordered a delicious looking drink called the Crispy Creme, and Sarah was intrigued by my beverage of choice and ordered the same. Vanessa ordered a pint of QV light; The Club only offers Quidi Vidi products on tap, the rest of the domestic and and imports are by the bottle. After we had ordered, we fell into our traditional non-stop girlie chatter while Rebecca brought over our drinks and some fresh sweet rolls served with molasses butter. I loved the twist on the Newfoundland classic bread with butter and molasses and the butter was oh so sweet and tasty! To start, 4 of the 5 of us had the French Onion Soup Les Halles which was served piping hot. The soup had bone marrow and was topped with bread and local Swiss cheese, and it was amazing! The bone marrow made the broth extra flavourful and the cheese was so melty and delicious not one of us could wait until the soup cooled off before digging in. 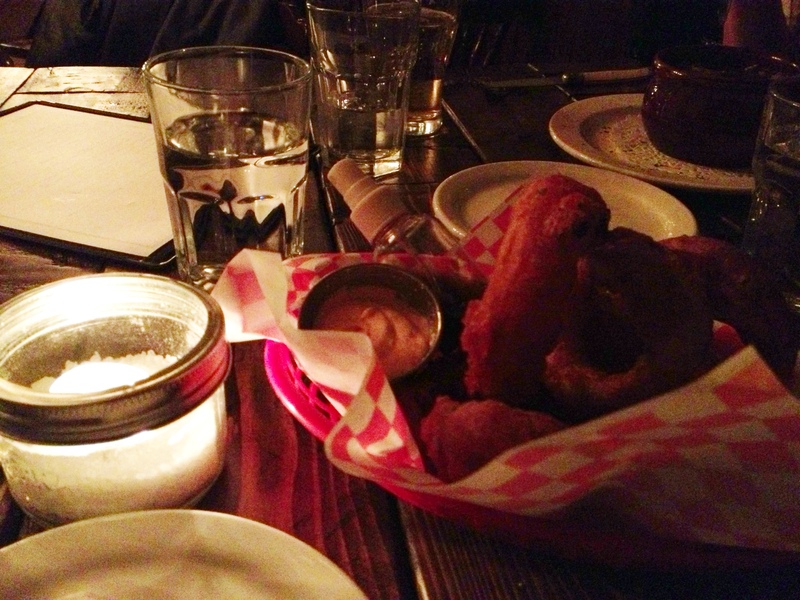 Sarah ordered the Q.V 1892 Onion Rings from the ‘Table Snacks’ section of the menu, and the giant rings came out in a big basket for everyone to share. There was also a small spray bottle of malt vinegar which you could spritz on your rings, something that was fun to do, and even yummier to eat. I though that was neat! In addition to my French Onion Soup, I just had to order at least one oyster because for some reason I have developed a taste for them in recent months. 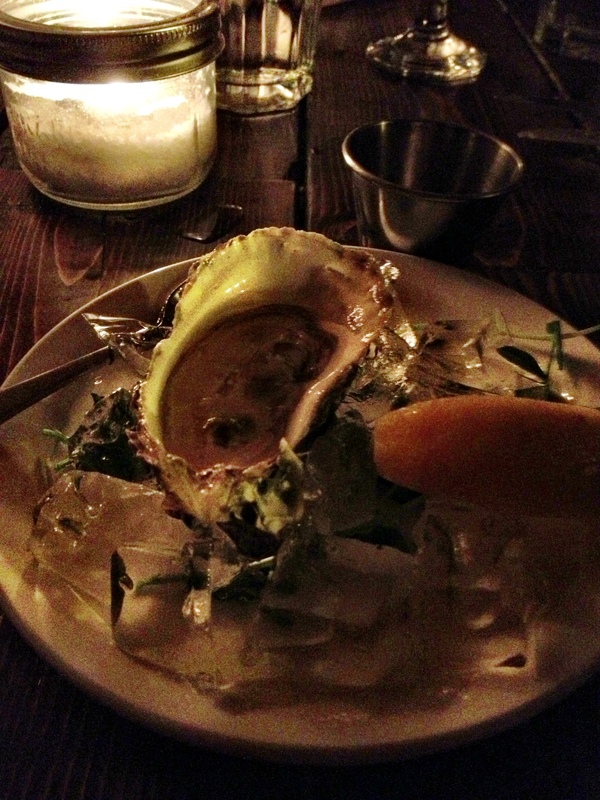 My single slimy beauty was served with lemon and a smoke tomato-basil mignonette, which was tangy and delicious. The Club also offers a variety of other things on their raw bar, including NFLD Seafood Ceviche, Steak Tartare, and Smoked Salmon. For mains, Meghan and Vanessa both ordered the Bacon Wrapped Meatloaf with garlic mashed potatoes. Though both ladies enjoyed the meal, they found it to be pretty unimpressive, and to be honest, it didn’t look that appetizing Both Sarah and Rachel ordered The Club Burger, which has apparently become the favourite among regulars, and it looked awesome when it came out. 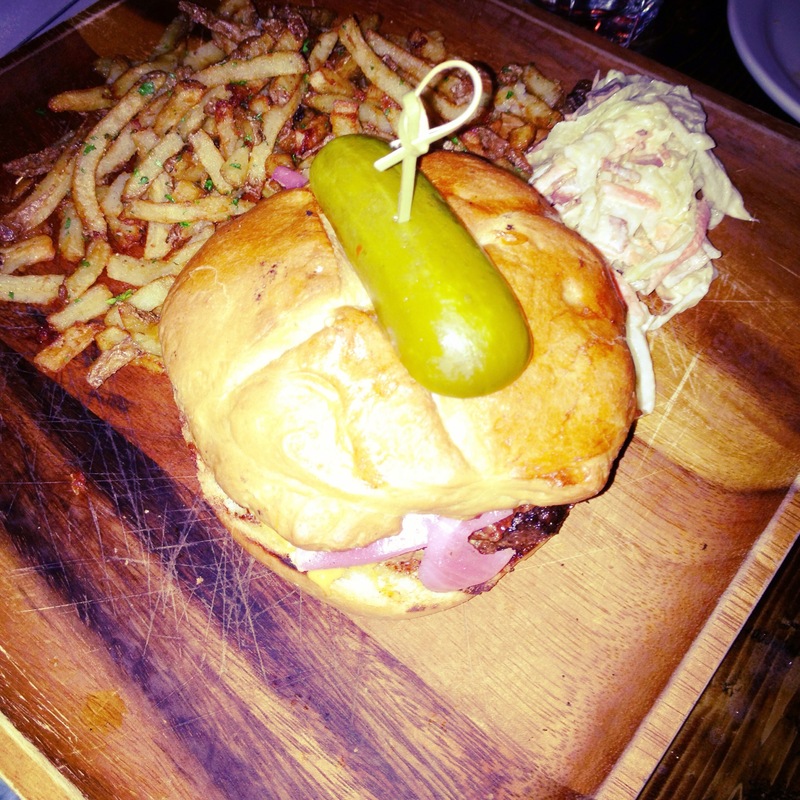 Served on a plank of wood, the burger’s presentation was interesting and appetizing. Rachel and Sarah both enjoyed the burger, but felt it wasn’t anything worth writing home about. I ordered the Hanger Steak because I was craving steak and this option was only 8 ounces, the perfect amount to follow my filling apps. When it arrived, I was impressed by its size; it was definitely more than advertised! However, it lacked the flavour that I have come to expect in this particular cut of meat, although the frites that I ordered alongside were amazing. Overall, the drinks, service, and ambience were great; the details and unique touches to the decor make it a real stand out in St. John’s. The appetizers were also quite impressive, but the mains were lacklustre Though I do think there is most definitely a place for a Gastropub like The Club in St. John’s, there needs to be some improvement on the imagination and consistency in the mains. This is a perfect place for a night out with the girls (or the boys) for great beer on tap, great oysters and raw bar, and an all around relaxing evening, but it is not the place for a three course meal. The next time you are on Duckworth Street take a bet on The Club and Explore. Eat. Repeat some oysters. Cost: Around 50$ per person for an app, main, side, drinks, tax and tip. 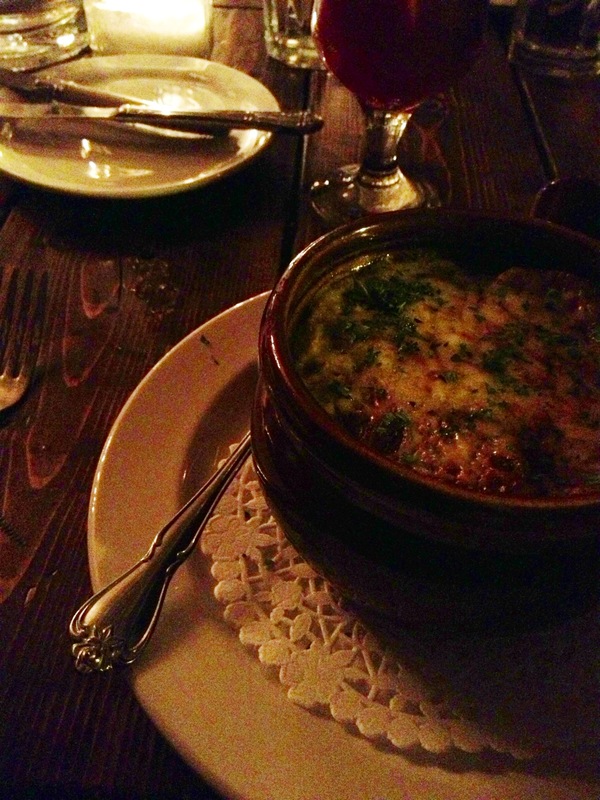 Things I liked: The atmosphere and decor, the French Onion Soup, the friendly service. 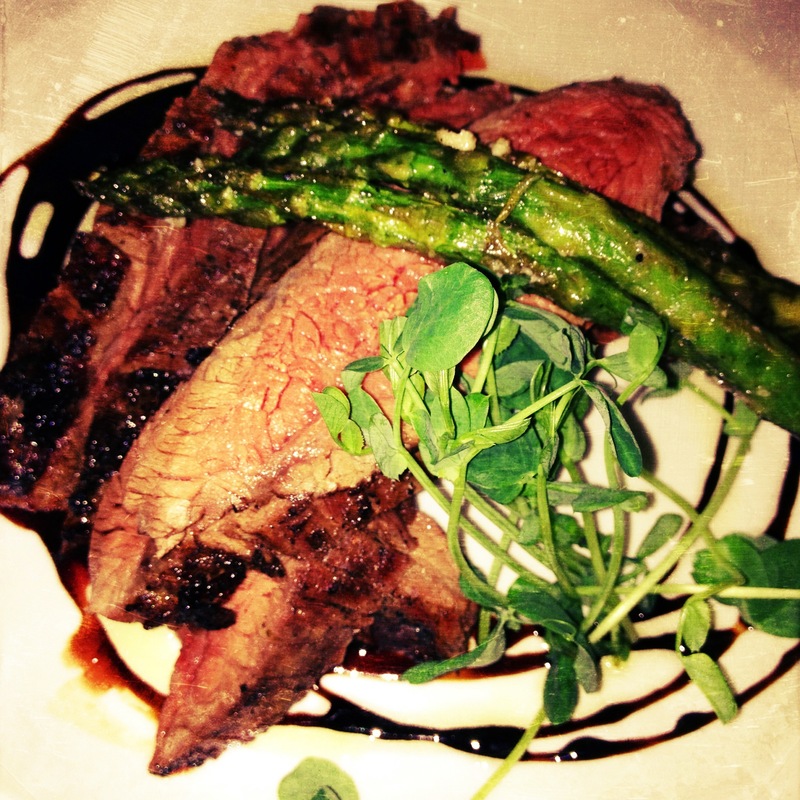 Things I didn’t: The pricey side dishes…and the uninspired mains. That Chelsea wasn’t there. The Best Place to Sit: In the back of the restaurant in the booth, preferably with your best friends!! 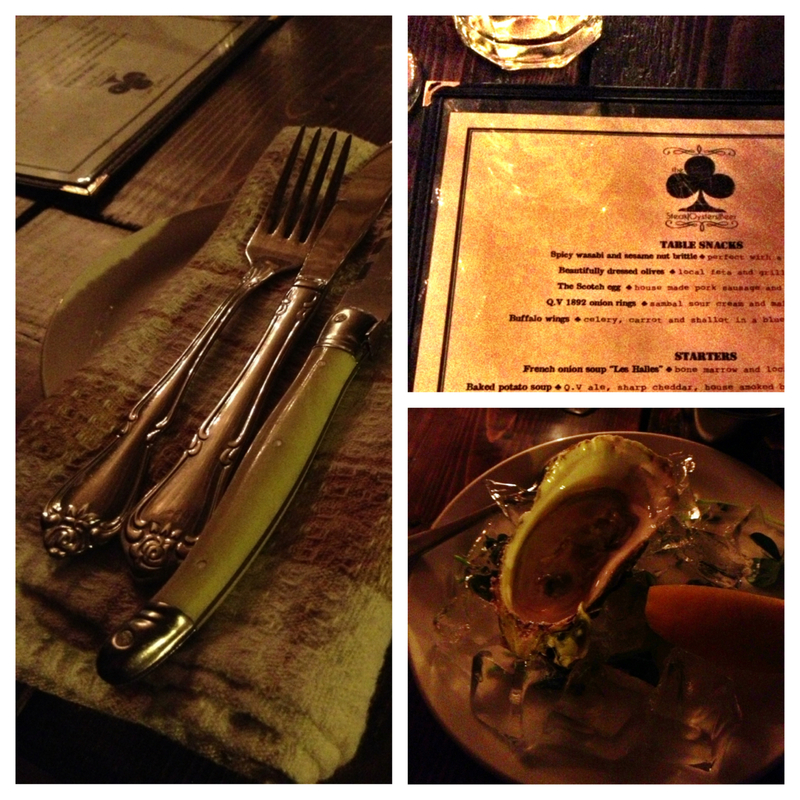 What to Order Next Time: The Steak Tartare and more Oysters! I ate there and wasn’t impressed. If your back in St. John’s try Saltwater its AMAZING!!! !